Glad you liked it! It's got a very neoclassical vibe to it. Once you get the licks down, you can create your own licks based on the licks you've learned and it looks like you have them down! You've got a good handle on pedal and modified pedal!! These make great speed training licks. STICKING THE LANDING: Per usual there is no gap between notes to allow your hand to recover, this is to get your hand used to being just ahead of the beat for placement. Otherwise things can sound laggy. Good job! CLEAN AS A WHISTLE: Your playing here is very clean which is what I like to see. Once you have a lick down, it's just a matter of repetition. PICKING LIKE A MAD MAn: Your use of muted alternate picking is quite good. 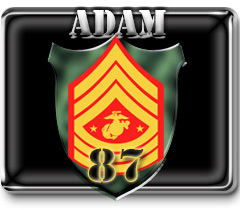 There is a lot of picking in this one and you killed it!Super congrats Soldier. This is one of the tough ones and you blitzed through it!!! Also, you are just barely behind the TOP DOG!!!!! !Congrats you just.. I loved this lesson even if it was a little tricky. It has "Neoclassical" in the title and it's enough to win me but I like the idea of switching strings and the pedal point type of licks. I tried transcribing excerpts from classical pieces and Final Fantasy and the kind-of pedal point where few notes stay the same and one note is changed appeared there often (e.g. one movement in Dancing Mad uses this very concept). I mean the last exercise. Does it have a name? I think pedal point happens when one note is sustained while the other change, so I'd call it some reversed pedal point? Cool vid and tune! The history is interesting as well. The German Battleship Bismarck was terror the sea, as mentioned in the song. She was thought to be unbeatable and unsinkable. She was the tip of the spear for KriegsMarine (German Navi). The British sent out their most storied and feared ship, the Hood, to take out the Bismarck. The Bismarck sunk the Hood with a SINGLE SHOT in about 5 minutes of combat. This was a serious blow to the British. After which, the call went out "SINK THE BISMARCK AT ALL COSTS". Essentially the entire British Navy (One of the largest in the world at the time) was tasked with one job. Sink that darn ship!! They finally found her. Somebody got a lucky shot on one of her propulsion screws and she could only turn in a circle after that point. After that it was just a matter of time. My mom just messaged me this vid and I've been listening to it for 20 minutes now. NICE!! This is a very tricky Mission. It's got pieces that feel like they work fast, then bits that won't let you play them brisk at all. Like hitting a wall. The good news is you played to the piece which is the point of this one. Let's Debrief! *PERFECT PACE: Pacing traps are everywhere in this one and you didn't fall for any of them!! *SINGLE STRING MADNESS: Your fret traverse on the single string is impressive. Never missed a note. Even used your pinky and went thumbless! It's great to see you back in the saddle Soldier!!! You jumped in on a very hard Mission and pushed through!!!! That tapping bit in particular is very very tricky. Using multi note taps with open strings is just hard! I'm slowly making progress on Serrana. Very slowly but it's the way to go, as you said. Some parts are stretch-heavy, so it will be a nice practice too! And maybe I'll learn sweeping through this exercise. Meanwhile I'm posting the exercises for Mission 86. The tapping part was a pain but I eventually got it. It's been a rude awakening to face this lesson after taking a break and it was noticeable for me. I'll try not to do it again or at least to practice even if I'm not recording. Since it's Easter time, I want to wish everyone good health and happiness! Enjoy these days with your families, friends and loved ones. 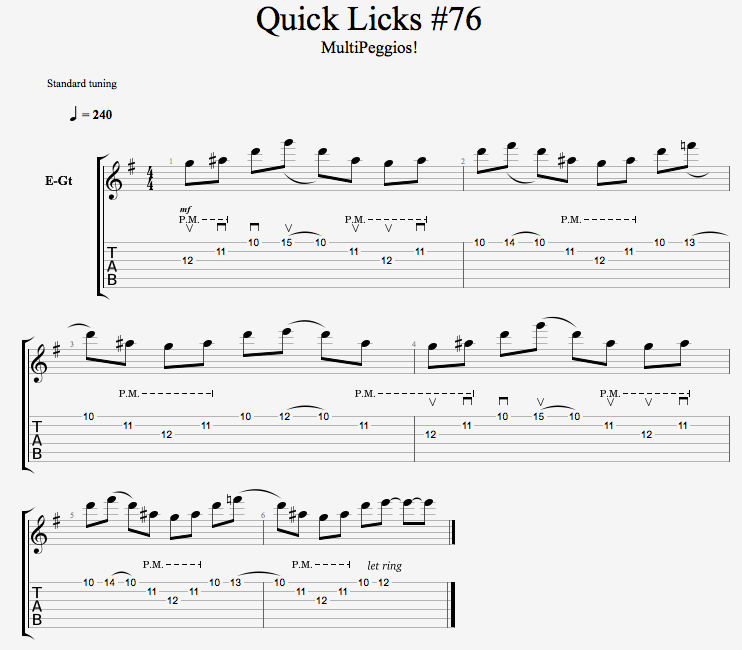 Quick Licks #76 - Multipeggios! In this quick lick, we are going to do what I call a "Multipeggio". It's a sweep picking lick where you sweep one shape and then change the note that you are hitting with your pinky each time you sweep. Basically moving the pinky one fret each time you do the sweep. It sounds much more complex than it really is. If you want to get some speed on your sweeps this is for you. This is very similar to our last quick lick so it should be a breeze if you have been keeping up! Hit me up with any questions. 'm guessing these are really good builds as they certainly seem to have spent money promoting it and the guy behind it has a great rep I'd love to see an Iron Label Dragon inspired build. Or even better a Ibanez Custom Shop Dragon sigil thing with flamed red maple and the dragon sigil in burst or paint. But I'd probably have to call them and have it built from scratch. The Principal Master Builder is Ron Thorn, he was a very very well respected small builder with a great following and reputation (he's a regular over at The Gear Page) and got an offer he seemingly couldn't refuse to join Fender Custom Shop. I was more excited to see him in the video than the others as I'd read so many of his contributions over the last 10 years. Seems like the Game Of Thrones Dragon guitar should be a bit more Metal and a bit less Fender Jaguar/Single Coil. Hmm. Great vid and great playing!!! This video is very cool. I recommend you to watch the whole thing, but I can agree more with the things that Rick says at 11:00.